The year 2016-17 has been a landmark period in several ways. Whatever be your political inclination or economic point of view, it cannot be disputed that the past 12 months have seen momentous change, not only for the global economy but also here in India. If Brexit, Britain’s vote to leave the European Union, was a move with widespread ramifications, November 8, 2016, will also be a date which few will forget in a hurry. The United States voted to bring in Donald Trump as the 45th president, and Indian Prime Minister Narendra Modi made the shock announcement demonetising high-value currency notes in a move aimed at dealing a body-blow to the black economy. Both these developments—Trump’s victory and demonetisation in India—will be discussed, debated and analysed repeatedly and their impact examined over and over again. Even as I write this, India has just completed a long-winding election process in five states—Uttar Pradesh, Uttarakhand, Punjab, Goa and Manipur—and the state governments are in the process of being sworn in. The biggest takeaway from these elections is, however, the landslide victory registered by the ruling Bharatiya Janata Party (BJP) in Uttar Pradesh, perhaps the most politically significant state in the country. BJP’s victory is being seen as a huge vote in favour of Narendra Modi’s style of leadership and governance, and is being interpreted by several quarters as a sign that the ordinary Indian is firmly in favour of even controversial moves like demonetisation. BJP also won in Uttarakhand and did well in Manipur, and that cheered the markets and the business community which now hope a stronger Modi government will be able to push through the next round of reforms aggressively. At Forbes India, the last 12 months were equally eventful as we delved deeper into the entrepreneurial ecosystem and brought you stories of enterprise which we hope demonstrate the unbridled energy of Indian entrepreneurs and their ability to surmount odds and chase their dreams of building successful businesses. 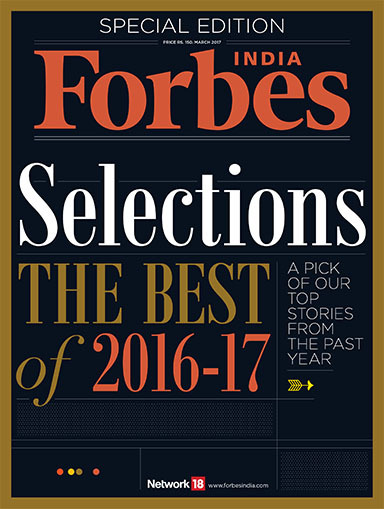 I must confess it was very difficult for us to choose from the several stories we did through the past year for this special issue, but we did our best to ensure this selection of Forbes India’s best is also representative enough of the activity which is taking place in the country’s entrepreneurial ecosystem. From the bootstrapped success story Zoho Corp of Sridhar Vembu, the sharp and innovative business model of Sanjiv Bajaj’s Bajaj Finserv and the canny investment philosophy of Ajay Piramal to the resilience of Hero MotoCorp’s Pawan Munjal who scripted a brilliant second act for his company, we think these examples (and the others in this issue) showcase the will and character of the Indian entrepreneur. Then there is the story of Yusuf Hamied of Cipla, a titan in his own right and the winner of the Forbes India Leadership Award for Lifetime Achievement in 2016. I would also urge you to read these stories in the context of the time they were published. There’s nothing we at Forbes India love more than being the chroniclers of such exciting entrepreneurial stories. And we are sure that as the government moves to free the economy of the shackles of red tape, the stories will get even more exciting. India, we believe, is an idea whose time has come.